56,948 eviction cases were filed against Illinois tenants in 2016. 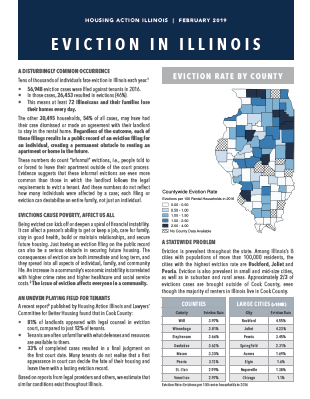 In those cases, 46% resulted in evictions, indicating that more than 72 Illinoisans and their families lose their homes every day. 54% of households did not have a negative determination against them but still ended up with an eviction filing on the public record that may be a serious obstacle to finding a future home. 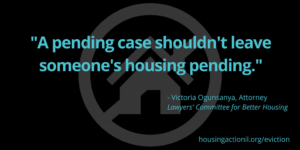 This report by Housing Action Illinois and the Lawyers’ Committee for Better Housing (LCBH) explores how an eviction filing on the public record is a serious obstacle to finding housing for people whose cases did not result in them actually getting evicted. This is true even in cases where the tenant didn’t violate their lease in any way. 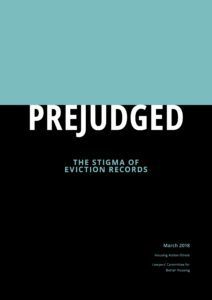 Prejudged: The Stigma of Eviction Records shows that 39% of eviction cases filed in Cook County during the past four years did not result in an eviction order and/or other judgment against the tenant. 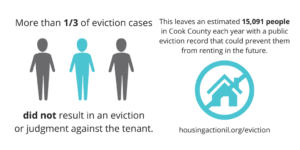 We estimate more than 15,000 people in Cook County each year ended up or will end up with a public eviction record when they never received a judgment against them in eviction court or were actually evicted. Illinois could help people who have an eviction filing on their record secure a home by expanding opportunities to seal eviction court records. Having an eviction court filing on your record can be a serious obstacle to finding housing. 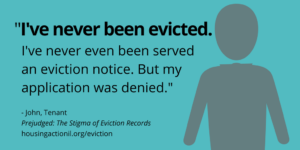 Too often, people do not understand that an eviction filing does not mean someone was actually evicted.